Beautiful fall pictures, Robert! 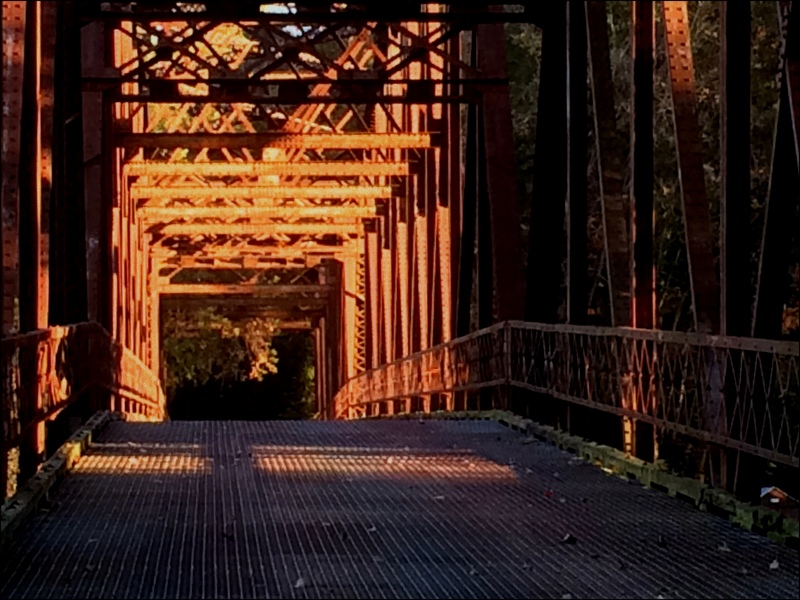 Even the old steel bridge is glowing in the late afternoon sun. Lovely photos, Robert. I’m still trying to get my head around the navy camouflage for the desert. Perhaps it’s remained green because it’s never been used, so no one realised it didn’t work too well? Thanks, Mick. It makes sense they’d have different patterns for different surroundings, but that one seems a bit puzzling. I personally have patented a camo called “Pale Beige Cubicle,” which I’m trying to sell to office workers, who are trying to hide and avoid their bosses. I think you might be on to a winner, there. Sort of speaking of waffles: Last night I overheard someone talking about pancakes. They said they had lemon pancakes in a restaurant, and they were delicious. That does sound good! It’s colder weather and flapjacks, etc. are sounding good. Inquiring (bilingual) minds want to know: do you have to pay a wee fee to use le wi-fi? 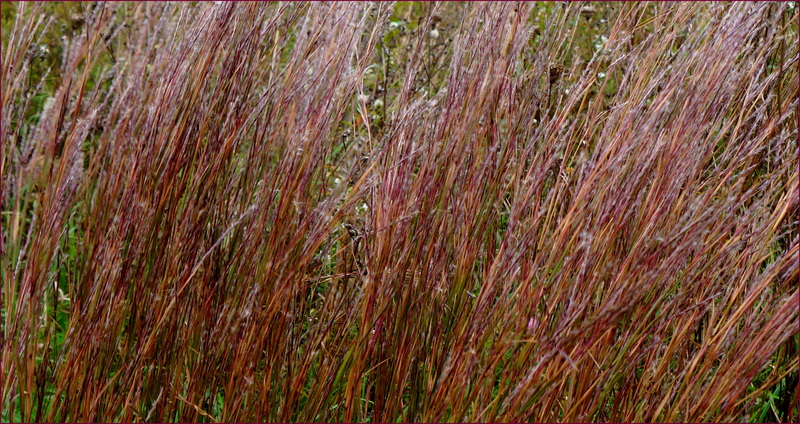 The reddish grass you asked about certainly looks like little bluestem, which I’ve enjoyed photographing at that late stage in Texas each fall. Maybe you should start a comic strip called Mimesis and Crypsis, with two characters that are hard to see. I can’t draw, either, but maybe we could collaborate with someone who can. The first part of my first comment just reminded me that as a math teacher I explained to my students that the name Fibonacci meant ‘child of Bonaccio.’ Then I’d go on with a straight face to claim that Fibonacci’s daughter was Fifi Bonacci. By the way, with all the scenic and historical things you show in your part of upstate New York, have you ever considered making a living by organizing tours to the area? Even way over here in Texas, New York State has run occasional commercials playing up its subsidized business development zones in economically depressed areas. I wonder if a company that offered tours would qualify for that sort of subsidy. A tour company might qualify, but my (very limited) sense is that you’d need some heavy-duty political connections or a lobbying firm. Nice photos and thanks for the water navigation lesson. Interesting stuff. I’ve always wanted to sail from NY Harbor to one of the Great Lakes. I miss NY, so thanks for the nostalgia. I was gonna comment on the wee fee as well, until Steve beat me to it. I don’t know if your query about the butterflies is wrong, but it might be questionable. Like your post, I’m not sure where this comment is going, and that’s no guano. Thanks Dave, and isn’t guano a cool word, much classier than what we usually say. “Guano Artiste” sounds pretty uptown. 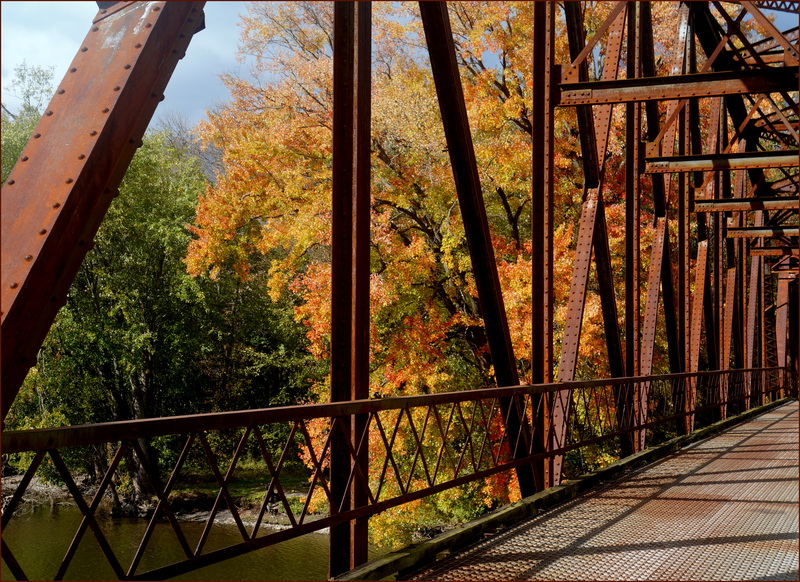 Ah, those old iron bridges … there are two that cross the Saranac River near my family home, appearing frequently in my past experiences and memories. One was replaced with something more modern that barely registers as a bridge when you drive or walk across it; it seems more like a big sidewalk now. The other, while still there, is now closed to pedestrians and vehicles — which is unfortunate because from that one you had a great view of the river, as the bridge was probably 80-100 feet above the water. 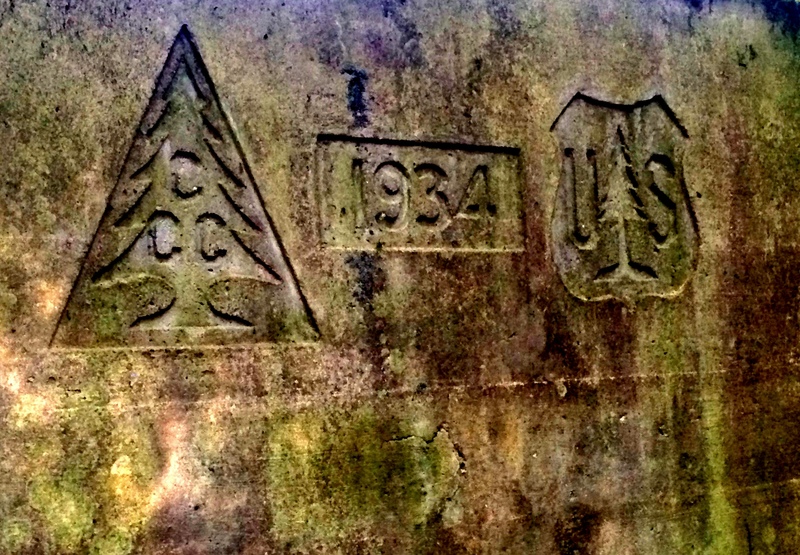 Too bad the states don’t think of them as historical sites, sink a little more into preservation, and at least keep more of them open for walkers and hikers. 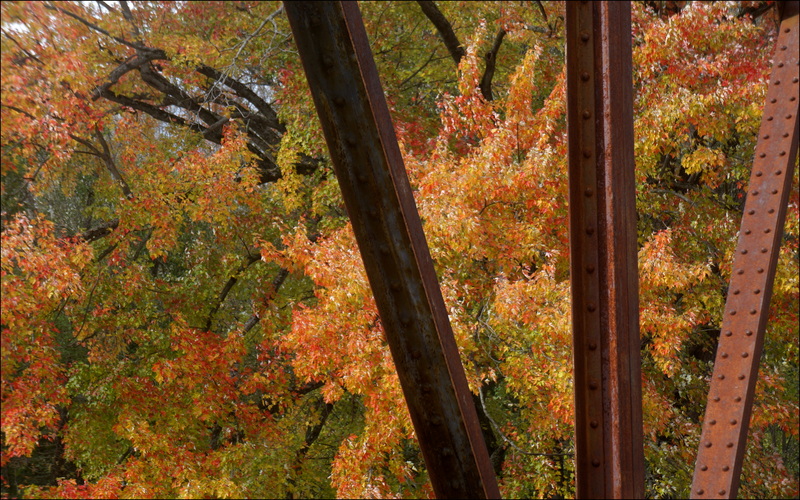 I always liked the deep red rust … gave the bridges real character and texture, especially in the fall when the light was low, the reds and oranges were accentuated, and the trees turned colors nearby …. like in your pictures! This bridge, despite 0 maintenance, seems to be in decent condition. I was sorry NYS didn’t take over the high RR bridge at Letchworth, over the falls of the Genesee River, one of the highest trestle bridges in the east. It’s been replaced by a new bridge, and the old one has been totally dismantled. So glad you liked the pictures. My dog hated going over that open grating on the bridge, but he loved the island (he was Labrador and liked to swim) and I think the bridge has gotten more handsome, as it’s aged. Thank you for the reminder about waffles! I haven’t had any in a while. I wonder if I could make waffles without a proper waffle maker. I guess I’ll have to try it on my blog. Cheers! 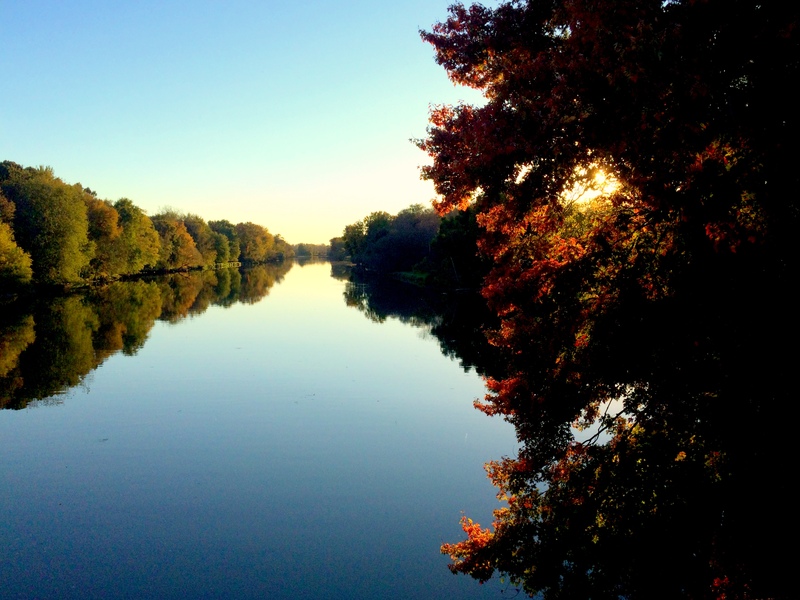 Those are lovely pictures at the beginning of the essay, from the bridge and of the placid waters. 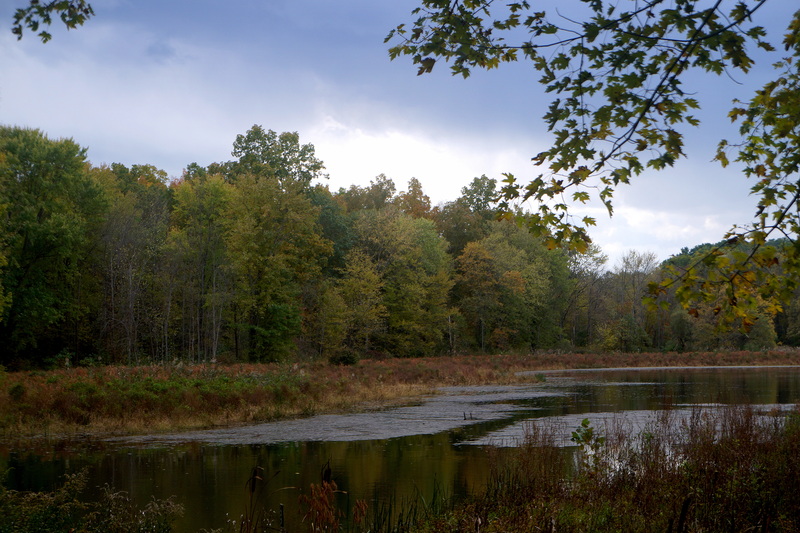 This reminds me of a former very fond acquaintance of mine from photography forum stuff on the web (regretfully who I lost touch with over the years as a result of my sporadic disappearances from the internet) who lived on a bend in the Seneca River. 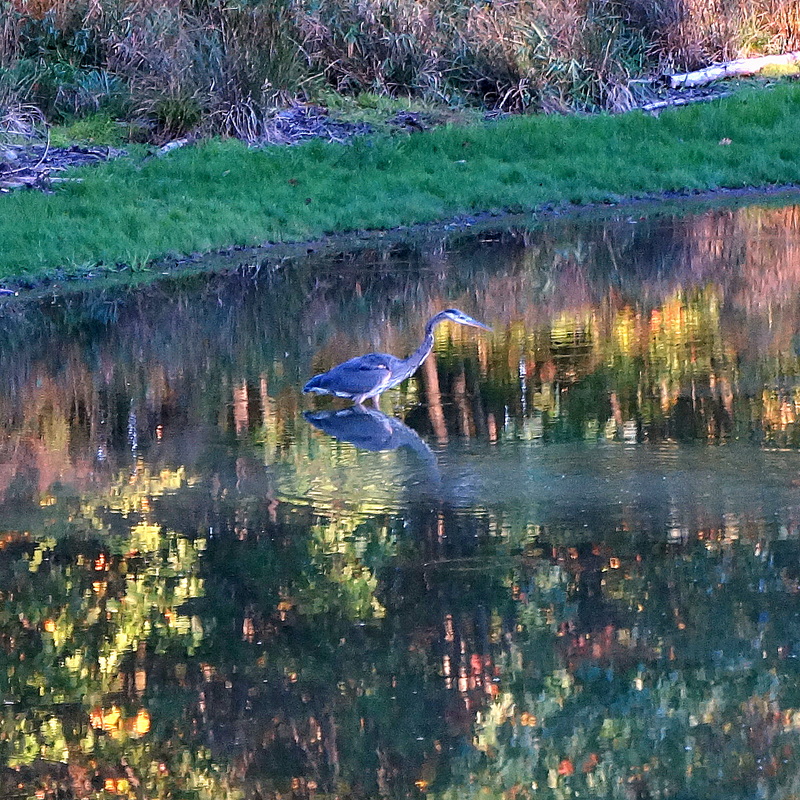 Her place had a broad, grassy lawn which sloped gently to meet the water and I swear not once did I ever see a scene from the river in that spot that didn’t resemble a mirror pond. Oh what a place to live. 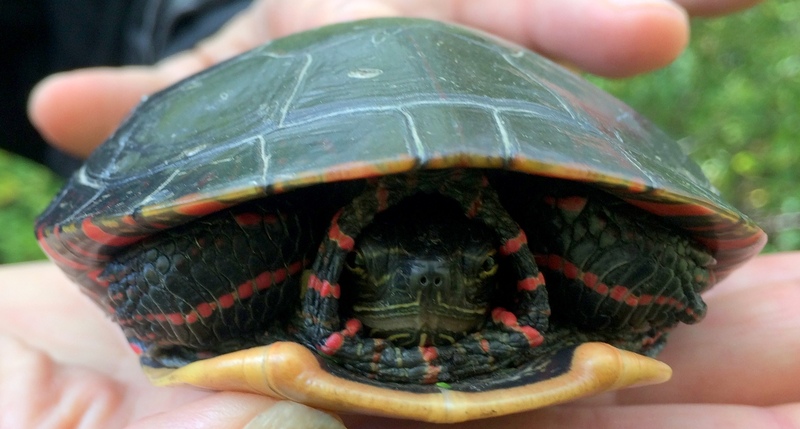 Re: meandering creeks and rivers affecting mental processes — there may be some truth to that. After all, I grew up among the cornstalks, and I’ve been accused from time to time of being rather corny. Well hay, corny is ok by me, better than a body wandering too far into the rye! I’ve just been looking at those first three photos of the bridges. Perfection. They didn’t even need CorTen steel to get that wonderful patina. If I had a chance to visit the area, I certainly wouldn’t waffle. Down here, we judge the severity of hurricanes by the number of Waffle Houses that are left once the winds die down. Come hellish winds or high water, Waffle Houses just keep on pouring that batter — at least, as long as they can. The FEMA Waffle House index for judging the severity of a hurricane is a real thing. There was a Waffle House in Geneva, torn down to put up (yet another) drugstore. Grrrr. So did you find a good place for waffles in Milwaukee? Your butterfly shot is wonderful. I like the way the yellow leaf brings out the yellow on its wings. 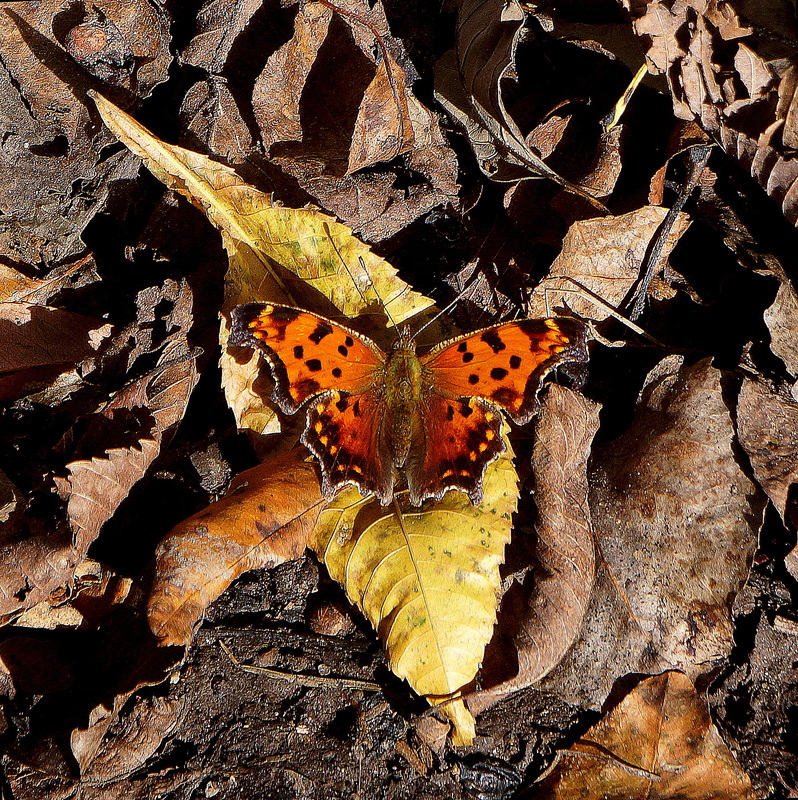 Anglewings, (Commas and Question Marks) and Mourning Cloaks will all surprise you by coming out on warm winter days. They feed on sap from trees and over winter as adults. 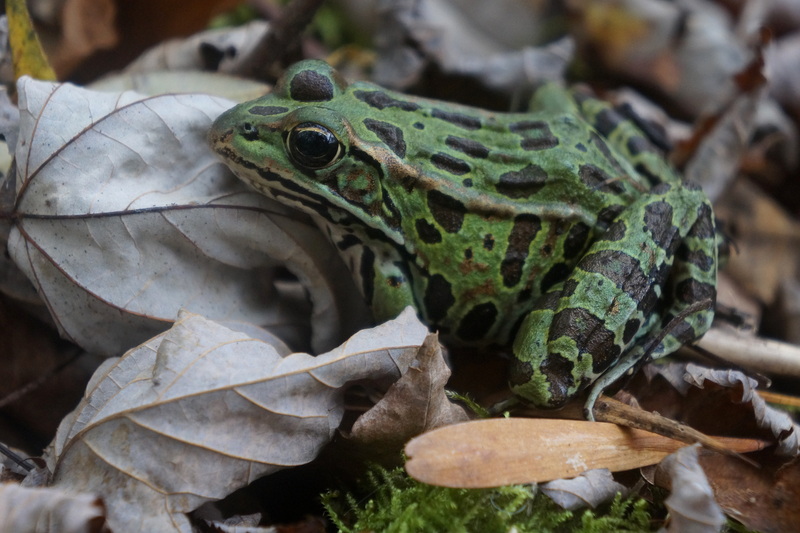 The lovely frog is a leopard frog, a real favorite of mine and a denizen of Illinois Beach State Park. Now, if you’ll excuse me, I need some waffles. Once the weather turns cooler – – pancakes, waffles, soup, stew, etc. all of them just start coming to mind, and you’ve gotta have ’em!